The Médecins Sans Frontières (MSF) search and rescue teams on board the Bourbon Argos, the Dignity I and the Aquarius (run in partnership with SOS Mediteranee) today rescued nearly 2,000 men, women and children from 11 separate boats in less than 7 hours. Many of the rescues were conducted in dramatic circumstances, with some patients requiring evacuation to the Italian mainland. Tragically, one young pregnant woman died after being rescued by the Dignity I and before she was able to be transferred to land. "It was a horrific sight"
“When we arrived to our second rescue this morning, people were in the water and some were close to drowning. It was a horrific sight”, said Nicolas Papachrysostomou, MSF’s field coordinator on Dignity I. “People were frightened and many of them were suffering from fuel burns, particularly women and children. Today’s intense rescues come just after the Bourbon Argos's return to operations, having been on stand-by since the 17 August when it was involved in an incident with the Libyan Coastguard. The 60 metre vessel was today engaged in 8 separate rescues taking on board a total of 1019 people. At the same time, the Aquarius was involved in the painstaking rescue of a staggering 720 people from one very overcrowded wooden boat. Those on board both the Bourbon Argos and the Aquarius are stable but the medical teams are treating many people suffering from non-life threatening illnesses. The Aquarius team has recorded a worrying situation in terms of nutritional status amongst the primarily Eritrean people rescued. Another 213 people were rescued by the Dignity I. 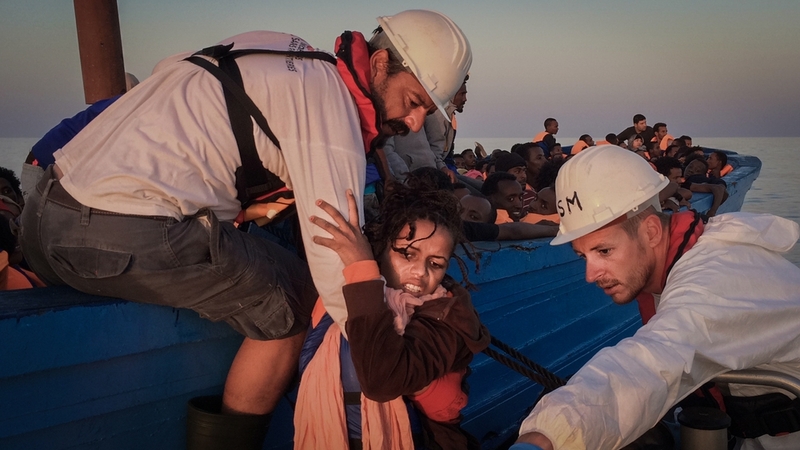 “In the absence of safe and legal alternatives to dangerous boat journeys, people continue to die in their hundreds in the Mediterranean Sea”, says Tommaso Fabbri, MSF’s head of mission in Italy. Dr Erna Rijnierse onboard the search and rescue vessel MV Aquarius treating violence-related injuries on Anon from Nigeria after a rescue in June of this year. Since 21 April, when MSF’s search and rescue operations began for 2016, the Dignity I, Bourbon Argos and Aquarius have rescued a total of 14,547, people in more than 100 different rescue operations, whilst at least 3,230 people have died in what has become the most deadly migratory route in the world. MSF continues to stress that although search and rescue is lifesaving and essential, the only way to truly stop deaths at sea is to provide safe and legal alternatives to dangerous sea crossings.